One of the most certain things in life is uncertainty. Your teen driver could hit a cyclist. A guest could fall down your stairs. A rainy morning commute on worn-down tires could result in a multi-car accident. 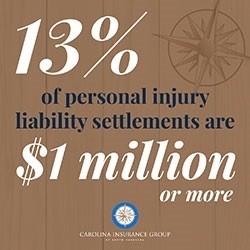 And, in all of these scenarios you could be held liable to others for the cost of damages – injuries, property destruction, emotional distress, lost wages and more. Good thing you have insurance. But, wait, your policy only covers $300,000 of liability, and in a lawsuit, you’re judged liable for $1 million. That leaves $700,000 left to pay. How will you cover it? How will your family be affected? Covering the Extra Expenses For many people, standard homeowner and auto insurance policies don’t include enough coverage to provide adequate protection. 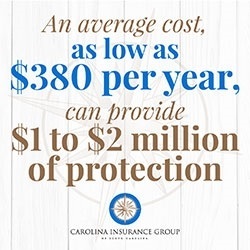 But, if you have umbrella insurance and your policy covers the incident, the additional $700,000 will come from your policy. If not, it will come from the assets you have now, such as your home and savings and from future assets, such as your wages or inheritance. The fact is, it only takes one serious accident and a resulting lawsuit to put everything you own – and will own – at risk. 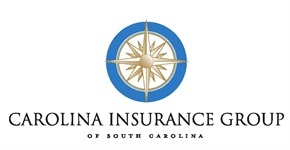 At Carolina Insurance Group, we can educate you on all the policies and what works best for you and your family. Having umbrella insurance can protect you from a potentially devastating future. An umbrella policy is not a stand-alone policy. Typically, your insurance carrier will require you to meet certain qualifications, such as having an auto policy with a certain level of liability coverage, in order to purchase umbrella insurance. Umbrella insurance won’t kick in until you have exhausted the limits of your other existing policies. Your car or home insurance is always your first line of defense – even if the cost of the damage exceeds your policies limit. Once this coverage meets its capacity that’s when umbrella insurance jumps in to cover the additional expenses. A single umbrella policy typically covers all household family members. 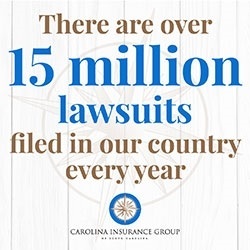 Not only will an umbrella insurance policy provide you with extra coverage when your other policies are exhausted, but it may also cover claims that are excluded under your other policies, including driving in a foreign country or renting a boat.